A quartet of speedsters are vying for front spot at the selection table. A quartet of speedsters are among the possible inclusions for the Saints’ must-win clash against the Hawks. Ben Long, Nick Hind, Robbie Young and rookie Doulton Langlands are all knocking on the door as the Saints set themselves for a season-shaping clash. 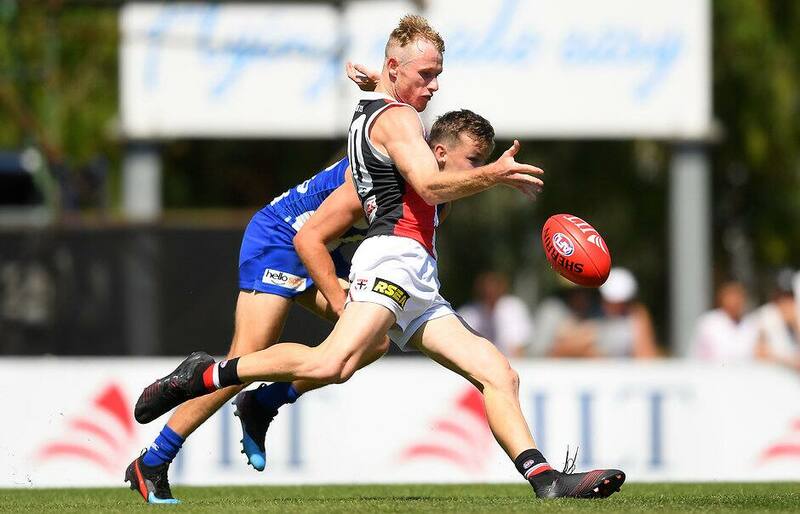 Long and Irishman Darragh Joyce were the unlucky omissions ahead of the Round 2 win over Essendon, and both are in the frame as the Saints look to bounce back from their loss in Perth. Ben Paton was the carry-over emergency last weekend and his name will be hotly debated after dominating at VFL level a week earlier. Joyce also travelled with the team to Perth after playing a half in the VFL on Friday night, and would provide additional aerial support in defence. Jack Steven looms as a possible inclusion after missing the trip west with his work-load managed, but he’s not the only speedster pushing for selection. Nick Hind bagged two goals from half-back in Friday night’s VFL game and looked at home at in the JLT series, while Robbie Young’s forward pressure has proved a weapon at state-league level. Rounding out the quartet of quicks is young rookie prospect Doulton Langlands. After a hamstring injury curtailed much of his pre-season, the Albury product has caught the eye in the past two weeks, with his explosive speed earmarking him for bigger things in 2019. The Saints take on the Hawks at 3.20pm at Marvel Stadium on Sunday afternoon.